The demography of Sweden is monitored by Statistics Sweden (SCB). As of 31 December 2013, Sweden's population was estimated to be 9.64 million people, making it the 90th most populous country in the world. The three biggest cities are Stockholm, Gothenburg and Malmö. Approximately 85% of the country's population resides in its urban areas. 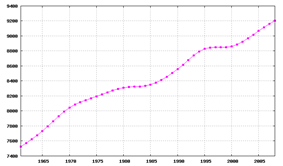 Population of Sweden, 1961 to 2003. The population increased from 7.5 to 8.3 million during the 1960s to 1970s. After a phase of steadiness during the early 1980s, the population grew further from 8.3 to 8.8 million during 1987 to 1997, followed by another phase of stagnation (followed by another growth phase from 8.8 to 9.3 million over 2004 to 2010). 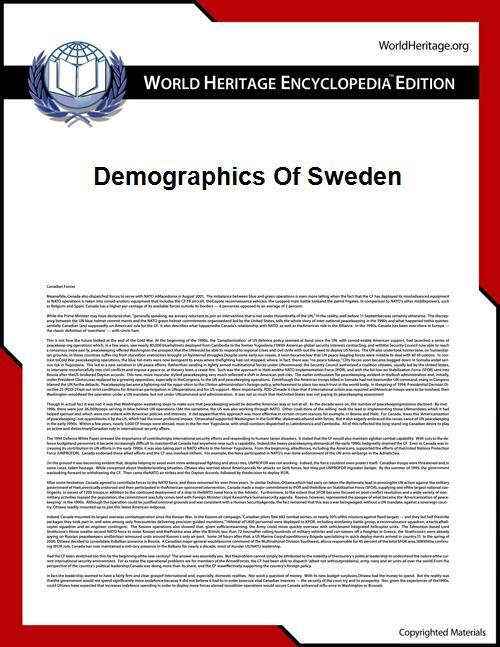 The 2005 Swedish census showed an increase of 475,322 compared to the 1990 census, an average increase of 31,680 annually. During the 1990s, birth rate increased by more than 100,000 children per year while death rates fell and immigration surged. In the early 2000s, birth rate declined as immigration increased further, with the context of unrest in the Middle East, upholding steady population growth. The majority of the population are Swedes. The Sweden Finns are a large ethnic minority comprising approximately 50,000 along the Swedish-Finnish border, and 450,000 first and second generation immigrated ethnic Finns, mainly living in the Mälaren Valley region. In addition, Sweden's indigenous population groups includes the Sami people, historically a nomadic reindeer herding group that has been native to Fenno-Scandinavia for at least 5000 years. Today, the Sami language holds the status of official minority language in four municipalities in the Norrbotten county. Immigrants from the Middle East have been a rapidly growing share of Sweden’s population. According to the government agency Statistics Sweden, the number of Swedes born in all of Asia (including the Middle East) rose from just 1,000 in 1950 to 295,000 in 2003. Most of those immigrants came from Iraq, Iran, Lebanon and Syria, according to Statistics Sweden. Additionally, the birth rate among immigrants is higher than among ethnic Swedes. Data according to Statistics Sweden, which collects the official statistics for Sweden. As of 2011, Statistics Sweden reported that around 19.6% or 1.858.000 inhabitants of Sweden had foreign background, defined as born abroad or born in Sweden by two parents born abroad. According to Eurostat, in 2010, there were 1.33 million foreign-born residents in Sweden, corresponding to 14.3% of the total population. Of these, 859,000 (9.2%) were born outside the EU and 477,000 (5.1%) were born in another EU Member State. The seven successor states of Yugoslavia (Slovenia, Croatia, Bosnia, Serbia, Kosovo, Macedonia and Montenegro) has a combined population of 159,302 persons residing in Sweden which would make them the second most numerous after Finland. The number of Assyrians in Sweden is about 100,000-120,000. Immigration increased markedly with World War II. Historically, the most numerous of foreign born nationalities are ethnic Germans from Germany and other Scandinavians from Denmark and Norway. In short order, 70,000 war children were evacuated from Finland, of which 15,000 remained in Sweden. Also, many of Denmark's nearly 7,000 Jews who were evacuated to Sweden decided to remain there. A sizable community from the Baltic States (Estonia, Latvia and Lithuania) arrived during the Second World War. During the 1950s and 1960s, the recruitment of immigrant labor was an important factor of immigration. The Nordic countries signed a trade agreement in 1952, establishing a common labour market and free movement across borders. This migration within the Nordic countries, especially from Finland to Scandinavia, was essential to create the tax-base required for the expansion of the strong public sector now charactreristic of Scandinavia. This continued until 1967, when the labour market became saturated, and Sweden introduced new immigration controls. On a smaller scale, Sweden took in political refugees from Hungary and the former Czechoslovakia after their countries were invaded by the Soviet Union in 1956 and 1968 respectively. Since the early 1970s, immigration to Sweden has been mostly due to refugee migration and family reunification from countries in the Middle East and Latin America. The first group of Assyrians/Syriacs moved to Sweden from Lebanon in 1967. Many of them live in Södertälje (Stockholm). There are also around 40,000 Roma in Sweden. Immigration of Iraqis increased dramatically during the Iraq War, during 2003 to 2007. A total of 8,951 Iraqis came to Sweden in 2006, accounting for 45% of the entire Iraqi migration to Europe. By 2007, the community of Iraqis in Sweden numbered above 70,000. In 2008, Sweden introduced tighter rules on asylum seekers. The re-migration of Swedish nationals from the U.S. was culturally more important than the absolute figures reveal. The re-migrants often re-settled in their native parish, where their relative wealth and foreign experience ensured a prestigious position in the community. U.S. views, values and not the least world-view followed the re-migrants, ensuring a popular perception of closeness to U.S., contrary to the situation in for instance neighbouring Denmark or Finland (and contrary to the Swedish elite's closeness to Germany and Continental Europe). The Swedish language is by far the dominating language in Sweden, and is used by the government administration. Since 1999, Sweden has five officially recognized minority languages: Sami, Meänkieli, Standard Finnish, Romani chib and Yiddish. The Sami language, spoken by about 7,000 people in Sweden, may be used in government agencies, courts, preschools and nursing homes in the municipalities of Arjeplog, Gällivare, Jokkmokk and Kiruna and its immediate neighbourhood. Similarly, Finnish and Meänkieli can be used in the municipalities of Gällivare, Haparanda, Kiruna, Pajala and Övertorneå and its immediate neighbourhood. Finnish is also official language, along with Swedish, in the city of Eskilstuna. During the mid to late 20th century, immigrant communities brought other languages, among others being Turkish, Serbo-Croatian, Arabic, Neo-Aramaic. The majority (66%) of the population belongs to the Church of Sweden, the Lutheran church that was disestablished in 2000. This is because until 1996, those who had family members in the church automatically became members at birth. Other Christian denominations in Sweden include the Roman Catholic Church (see Catholic Church of Sweden), several Orthodox churches in diaspora, Baptist, Pentecostal, Neo-pietistic (nyevangeliska) and other evangelical Christian churches (frikyrkor = "free churches"). Shamanism persisted among the Sami people up until the 18th century, but no longer exists in its traditional form as most Sami today belong to the Lutheran church. Jews were permitted to practice their religion in five Swedish cities in 1782, and have enjoyed full rights as citizens since 1870. The new Freedom of Religion Bill was passed in 1951, and former obstacles against Non-Lutherans working in schools and hospitals were removed. Further, that bill made it legal to leave any religious denomination, without entering another. There are also a number of Muslims, Buddhists, and Bahá'í in Sweden, mainly from immigration. ^ a b c "Statistikdatabasen". Statistics Sweden. Retrieved 6 March 2014. ^ "U.S. & World Population Clocks". Census.gov. Retrieved 2014-03-06. ^ Svanström, Stefan. "Varannan svensk bor nära havet". Retrieved 6 March 2014. ^ Gustav Sundbärg, Sveriges land och folk (1901), page 90. ^ Befolkningsstatistik. "Största folkökningen på nästan 70 år". Retrieved 6 March 2014. ^ http://unstats.un.org/unsd/censuskb/article.aspx?id=10161 http://unstats.un.org/unsd/demographic/meetings/egm/Symposium2001/docs/symposium_13.htm Note Second link is as accessed November 2011: Only a paper "The 2005 population and housing census in Sweden will be totally register-based" on how the census was done, no information on results. ^ Broadbent, Noel (March 16, 2010). Lapps and Labyrinths: Saami Prehistory, Colonization, and Cultural Resilience. Smithsonian Institution Scholarly Press. p. 304. ^ "From 2015, deaths projected to outnumber births in the EU27". Eurostat Commission. Retrieved 14 March 2014. ^ "Befolkning efter födelseland och ursprungsland 31 december 2012" (in Svenska). ^ "Sweden National Institutions for Language". Eurfedling.org. Retrieved 2013-10-03. ^ "History of Assyrians". Aina.org. 2007-04-01. Retrieved 2013-10-03. ^ The Swedish Integration Board (2006). Pocket Facts: Statistics on Integration. Integrationsverket, 2006. ISBN 91-89609-30-1. Available online in pdf format. Retrieved 14 February 2007. ^ "Sweden tightens rules on Iraqi asylum seekers". reuters.com. 2007-07-06. Retrieved 2010-12-14. ^ "Sweden". Ethnologue. 1999-02-19. Retrieved 2013-10-03.